Hybrid lilies can be classified into two categories, Oriental hybrids and Asiatic hybrids. Orientals are characterized by large (6-8"); highly fragrant; red, purple, pink, or white flowers. Asiatics have smaller blooms (3-4") with no fragrance and are available in bright shades of gold, yellow, orange, rose, pink and white. The natural season for flowering of Asiatic lilies is late spring and early summer. Oriental lilies bloom naturally in late summer. Asiatic lily bulbs can be stored in coolers for forcing virtually year-round by freezing the bulbs. Oriental lilies, except for a few cultivars, cannot be stored for more than nine months. Therefore, they are scarce to come by during January, February and March. Although availability of Asiatic bulbs is now almost year-round, hybrid lilies are primarily marketed from February through May and particularly for Easter and Mother's Day. Asiatic lilies are a relatively short-term crop, 60-90 days vs. 80-130 days for Orientals depending on cultivar. Hybrid lilies are not difficult to grow as potted plants if a few basic cultural requirements are adhered to. Adjustments and improvements can be made to the standard forcing information based on the grower's experiences with cultivar responses to specific greenhouse environments. One of the most important things a grower can do to greatly improve quality is to give the bulbs a 10-20 second preplant fungicide dip to prevent diseases that cause root rot. This is important for two reasons, first to get the fungicide coverage right onto the bulbs from the beginning, and secondly to rehydrate the bulbs to uniform turgididty, allowing for more uniform emergence. A well-drained, growing media is essential for proper growth of lilies. Because many liles can develop leaf scorch due to fluoride, the medium should not contain superphosphate or perlite. Also, check the pH of the media. For Asiatic hybrids pH should be maintained at 6.5 and for Oriental hybrids, pH should be 6.5 to 6.8. Growers should be prepared to plant bulbs as soon as possible after they arrive. If bulbs must be stored, place at temperatures of 32-35º F.
One of the most common mistakes made is not potting the bulbs deep enough. Standard size pots are strongly recommended over azalea (three-quarter depth) pots due to the extra depth of the standard pot. This extra depth allows more growing media to be placed over the top of the bulbs, thus allowing for adequate stem roots to develop. Adequate stem roots cannot develop if bulbs are potted with less than 2" of growing media over the top of the bulb. It is these stem roots which provide uptake of nutrients and moisture required by the growing plant to support it to its full growth potential. With a poor stem root system, the plant will suffer in quality, especially if forced in stressful situations such as high temperatures and low light. Once potted, bulbs should be watered in thoroughly to compact the soil around the bulb. Watering there after must be carried out sparingly to avoid rotting off the new root hairs. Since there are not many roots at this stage to absorb water, little water is required. The soil should never be allowed to dry out, while at the same time the soil must not be too wet. When the shoots are 2-3" tall the stem roots are usually well developed, and more water is required as the growth rate increases. To provide the best foliage and color display of genetic dwarf cultivars of Asiatic lilies, some growers have started using five 10/12 bulbs in 6.5 inch pots. Some growers are starting the pots in coolers at 35 - 40º F for a period of 1-2 weeks, or until the shoots are about 1-2" tall. This provides ideal conditions for stem roots to develop so that when they are placed into the greenhouse, the plants will have the ability to make use of the fertilizer and water supplied, rather than relying on the bulb itself for all of its nutrition. Secondly, starting pots in the cooler will reduce the number of days that the pots will take "on the bench" in the greenhouse. Finally, this procedure will allow the grower to grade the pots for uniform stem length from the cooler to allow for better management of the bench space. This practice is not needed when forcing during cool months but is particularly useful when forcing during warmer months. Lilies require a medium to high light intensity (2500 foot candles). Lily height is a function of light intensity. The higher the light intensity, the shorter the plant. Lilies planted in December or January for an Easter market will probably be taller than lilies planted in late February for Mother's Day. Be sure to allow more spacing between pots when forcing during darker periods to ensure that the crop stays short. Asiatic hybrids are susceptible to bud abortion during periods of low light. Some varieties are more susceptible than others, but in general supplemental lighting will reduce the incidence of bud abscission and bud blasting in Asiatic hybrids. The Oriental hybrids are not as prone to bud drop, however, the use of supplemental lighting will extend the daylength can reduce the forcing time by 3-4 weeks. In the Netherlands, supplemental photosynthetic lighting is used mainly for cut flowers scheduled during the winter months and in our country, some growers are starting to use supplemental lighting as well. Best quality is seen with plants finished at cool temperatures (58-60º F). Growing at improper temperatures will cause serious problems. Asiatic hybrids should be grown at 50-55º F nights, and 60-75º F days. Slightly warmer nights (60-65º F) are required by Oriental hybrids. Height control is one of the more difficult aspects of pot lily forcing. Forcers need to rely greatly on their past experience with the various cultivars and then decide whether or not to use a growth regulator. Oriental and Asiatic lilies respond to A-Rest applied when the shoots are 1-2" tall. Drench applications of 0.5-1.0 mg a.i. per pot are effective in controlling height of Oriental lilies and drenches of 0.25-0.75 mg a.i.per pot usually reduces the height of Asiatic lilies 25-50%. If soil drenches are to be used, split applications are usually best. The first should be applied at shoot emergence; the second 10-14 days later. There may be differences in cultivar response, so it is important to keep accurate records for future reference. Use this information as a guide and keep light intensity in mind. Sprays are not effective because of the lack of leaf surface early in forcing. Also, note that A-Rest may be less effective in growing media containing bark. There is no documented work for using DIF to control height of hybrid lilies, but most likely, manipulating temperature will work. This is one method of height control that growers may want to try. The bulb itself is an excellent food reservoir, and will provide sufficient nutrients to support the initial plant growth up to shoot emergence, particularly if fertilizer has been added to the growing media prior to potting. Once the shoots are 2-3" tall, the stem root system is well formed and the increased rate of plant growth will require supplimental feed. A liquid fertilizer applied at the rate of 200 ppm nitrogen and potassium has proven successful. However, due to the wide range of growing media used, a soil analysis is recommended to determine optimum rates. Avoid superphosphate because of potential leaf scorch damage from fluoride. Maintaining the pH at optimum levels will help avoid this scorch problem. Over-crowding of the pots will cause the plants to stretch, induce lower leaf drop and lead to cultural problems such as botrytis, bud abscission, and bud blasting. Hybrid lilies can be started pot to pot, but the final spacing will depend on variety, season forced and size of pot. Be sure to allow enough time to force hybrid lilies. Even with all of the cultural data, and forcing time tables available, there is no substitute for practical, hands-on growing experience in your greenhouse with your growing practices. Try forcing lilies on a small weekly program to learn how the different cultivars react at different times of the the year. This knowledge will help when putting together schedules especially for holidays. 1) Generally for Asiatic cultivars, there will be a period of 30 days based on 50-55º F NT from the buds becoming visible until market stage (puffy, colored, but not open), and for Oriental hybrids 45 days based on 60-65º F NT. The grower can therefore, predict the marketing date in this way from plants "on schedule" at the time buds become visible. 2) It takes approximately 30 days from emergence to visible buds and another 30 days from visible buds to marketing date for Asiatic hybrids. Also, when buds are visible, Asiatic hybrids have completed 55-60% of their total forcing time. Forcing time will vary due to bulb planting date, temperature, light intensity, and planting density. Temperature is the single most effective factor in altering the speed of development of pots already in active growth. Lowering or raising it can modify the time to force by 15 days with no detrimental effect on the plants. Be aware that Oriental lilies open much more slowly than Easter lilies. Lilies should be marketed when the first bud begins to color, three or four days before opening. Shipping at this stage prevents lilies from arriving at retailers with open, damaged or senescent flowers. Potted Asiatic lilies don't hold up in cold storage as well as Easter lilies. Therefore, if a crop is too early, it's much better to drop the greenhouse temperature before plants reach market stage than to sleeve and box lilies and place in cold storage. The fact that lilies don't hold up in the market channel as well as other potted plants is a real plus for local growers. They can compete with the superior quality of a plant that doesn't have to be shipped long distances. Wholesalers and retailer should be advised not to store potted lilies, but should market them as soon as possible. Consider more than one market for potted lilies. Besides the traditional market for florists' pots, try marketing lilies planted in deep quarts (1 bulb) and gallons (3 bulbs) as potted perennials. They can be a beautiful addition to your existing line of perennials. For this market, growers aren't restricted to the short cultivars and can choose from a broader range of cultivars. 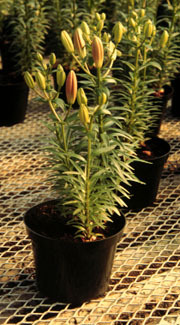 Asiatic lilies are susceptible to flower bud abscission (bud drop) and flower bud abortion (bud blast). Flower bud abscission in Asiatic hybrids is closely related to low light levels during winter forcing. The biggest problem with some cultivars of Oriental hybrids is abscission and yellowing of lower foliage. Older varieties are more prone to leaf drop. Growers can help prevent this problem by choosing cultivars not as susceptible and by growing at optimum conditions and avoiding situations such as warm temperatures, low nitrogen, root rots and overcrowding that contribute to lower leaf drop. 'Stargazer' is currently the most common Oriental cultivar being forced for pot plant sales for Mother's Day. New cultivars are available with major reductions in forcing time and I suspect we will see more growers adding them to their crop line. Many Asiatic cultivars are available in a range of colors from white to pink to orange and yellow. Genetic dwarf varieties are rapidly becoming the standard for pot forcing as they need no growth regulator treatment. Beck, R. 1992. Hybrid Lily: Pot Plant Production. Ohio Florist Short Course Seminar. Beck, R. 1988. Hybrid Lily Bulbs: Pot Plant Production. Ohio Florist Short Course Seminar. Ball Red Book, 14th edition. 1985. Reston Publishing Co., Inc. Reston, Virginia. DeHertogh, A. 1985. Holland Bulb Forcer's Guide. International Flower-Bulb Centre, Hellegom. Pot plants: Dwarf lilies add spice to pot market. Greenhouse Manager. April 1989. McKenzie, K. Potted lilies made easy: The new, naturally short Asiatic lily varieties. Grower Talks. April 1989. Miller, W.B. 1992. Easter and Hybrid Lily Production. Volume 5. Timber Press Growers Handbook Series.